One of Yang’s earliest works is Lucky Family (1995) depicting some telling permutations of coupling. 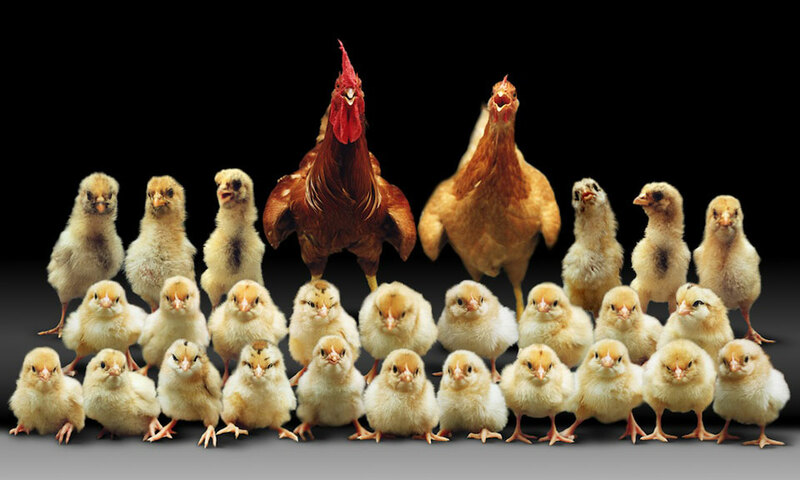 We see two chickens, a hen and a rooster, with and without progeny – no chicks, one chick, two chicks and a surfeit of chicks. These are the possibilities in life for some reproductive organism, and especially pertinent from a Chinese point of view. We can be childless, could have some or lots of children, but in China, right now, child-wise, officially one is the right number. There are so many implications (so much that might come home to roost) in the foreseeable future of this country, and in conversation Yang is very articulate about this; on the other hand, his work could hardly be described as didactic. As with the massage chairs, he could hardly have chosen a better medium for extracting a wealth of possible meanings out of his subject matter. Walter Benjamin referred to art in an age of mechanical reproduction; here, Yang reveals himself to be one of the artists most adept with digital technology. The social/genetic engineering to which he refers – with chickens standing in for human beings – finds a perfect analogy in a means of infinite and exact reproduction, with which “cloning” is common-place.